Free Password Strength Meter checks the level of strength of your passwords. It uses information entropy as a measure of strength and reliability. Free Password Strength Meter checks and displays the strength of your passwords, in bits of entropy. It also shows you the level of password strength using a scale of levels: very weak, weak, reasonable, good, strong and very strong password. It is recommended to use only passwords with a strong and a very strong level of strength. Those passwords are unpredictable and complex enough to effectively resist guessing and brute-force attacks. Check your passwords with Free Password Strength Meter and use only strong and secure passwords to protect your privacy. 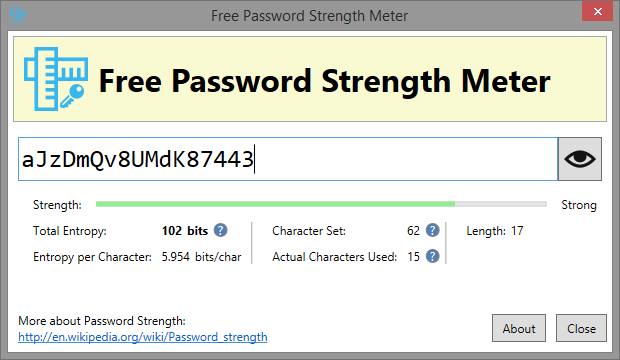 Free Password Strength Meter is a freeware product. It works on Windows 10, Windows 8, Windows 8.1, Windows 7, Windows XP and Windows Vista. It help to find idea. Its can help to check idea before implementation. Try MDF Open File Tool if the damage affects corrupted databases in MS SQL Server format and restore all tables, items and other objects on any computer, connected to the database server of your company. This tool repairs MDF files of any version.